Climate change movement 350Afrca.org recently launched its Fossil Free Africa campaign, with a call on ‘dirty banks’ to fully disclose their fossil fuel investments and commit to stop financing future mining, refinery and power station projects in South Africa and across Africa. 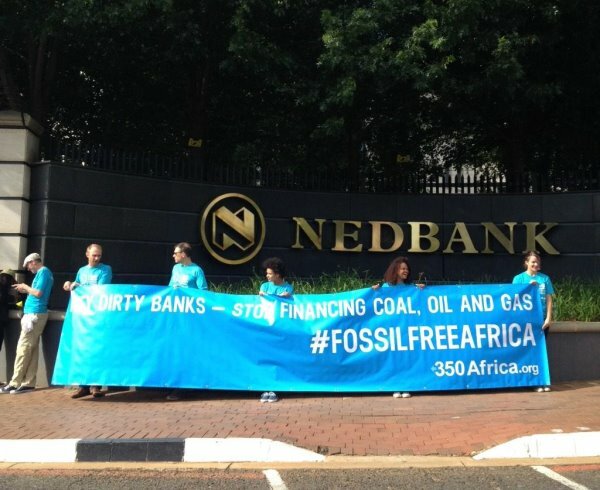 Activists protested outside the headquarters of Nedbank in Sandton, Johannesburg citing the ‘hypocrisy’ of the bank in calling itself ‘the only green bank,’ whilst having invested over R970m in African fossil fuel projects. More from 350.org: 2014 is on track to be a record year for global CO2 emissions yet global commercial banks’ investments in coal have continued to increase. This follows a record year for coal finance in 2013, with banks globally providing more than R880 billion ($88 billion) to the main 65 coal companies, over four times the amount provided in 2005. South African banks are playing a crucial role in financing Africa’s growing addiction to fossil fuels, the biggest emitters of CO2 and other greenhouse gas emissions that drive global climate change. 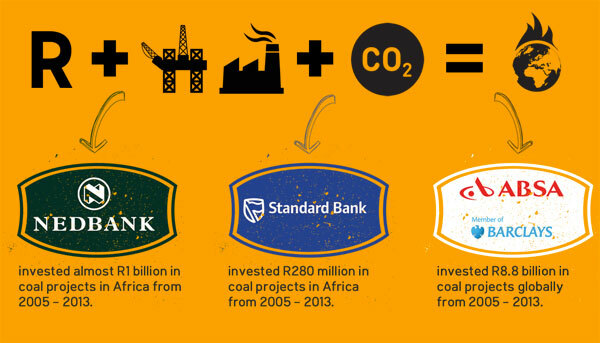 Despite various corporate sustainability claims, figures from the recent annual reports of Nedbank, Standard Bank and Absa / Barclays show a combined R10 billion of direct financing for coal projects between 2005 and 2013 which contributed to combined annual profits of over R32 billion in the 2013 financial year. Leading the protest Ferrial Adam of 350Africa.org said “dirty South African banks are financing billions of Rand of fossil fuel projects across Africa, whilst claiming to be environmentally friendly in a cycnical greenwash attempt. Communities across South Africa, including in locations around Witbank and Springs, have been paying this real cost of coal for decades. Extracting and then burning coal uses and pollutes huge amounts of scarce water and creates poor air quality, both of which impact on the health of the communities who have to live near mines and power stations. Globally, 80% of all known fossil fuel reserves need to stay in the ground if global average temperatures are to be kept to a 2 degrees future rise. Even at 2 degrees climate scientists predict that the impacts will fall hardest on Africa and with temperatures already rising, the impacts are happening now. Increases in drought and flooding are driving up food prices and making water even scarcer, hurting people from all walks of life. Keep 80% of fossil reserves in ground – but erect more coal power stations? Against this backdrop, the South African government is considering backing future coal power stations and hundreds of new coal mining licences are also under consideration. In places like the pristine Waterberg biosphere, and at Mtunzini and the Imfolozi National Park, both in Kwa Zulu Natal, new mines post a twin threat to the wellbeing of people and to cherished natural heritage. Adam again, “A just transition away from coal to clean solar and wind energy will certainly not happen over-night, so this is just the beginning of the Fossil Free Africa campaign. “We can have a fossil free future with solar and wind providing locally-generated electricity for millions of people but it must start now with a step change in investment in clean renewable energy. Banks, pension funds, universities and faith based organisations must commit to stop financing future projects, divest their existing investments and back renewable energy”. The campaign is part of the fast growing global grassroots divestment movement, which has seen over 160 universities, faith based organisations and pension funds commit to moving their investments out of fossil fuel companies in the last 4 years. The World Council of Churches is the latest organisation to have answered calls to divest from leaders including Archbishop Emeritus Desmond Tutu and grassroots activists across the world. The Fossil Free South Africa campaign launched last week and includes calls on UCT and other varsities across the country to divest their endowments.